Are you a new catering/food business on the lookout for premium hot dogs and sausages? Are you thinking of offering great quality hot dogs to your customers? Then you should try the below German beauties: all of them a true delight. And, of course, if you are thinking about buying premium hot dogs and sausages at wholesale prices we are at your disposal. The Sausage Man supplies excellent quality hot dogs and sausages: our products will meet the needs of any UK distributors and leave your customers begging for more. Please visit our testimonials page to find out what our customers say about us. For more information on Frankfurters UK please visit the page. 5 German Sausages Catering Businesses Should Give a Try! What can we say about frankfurters that hasn't been said before: they're known around the world and there's a reason why! These tasty, juicy, easy to cook sausages are the pinnacle of sausages in general. Easy to see nothing can top the frankfurter... oh, well, maybe some German mustard and ketchup! Frankfurters can be found everywhere in the world but beware of the quality! Here at The Sausage Man we make sure that your wholesale frankfurters are the best you can find around. Unbeatable taste for unbeatable prices. These traditional German sausages are a classic. They usually consist of minced beef and pork seasoned with different spices. The weisswurst can be grilled and served with mustard and you can find different varieties like the Nürnberger or Thüringer bratwurst. A really tasty German sausage that many people simply love. The word Weiß in German means white; easy then to imagine the lovely colour these sausages have. Delicate and beautifully made, the traditional Bavarian sausage has been made with minced pork and spices. It is customary to eat these accompanied with beer, pretzels, and, of course, German mustard. 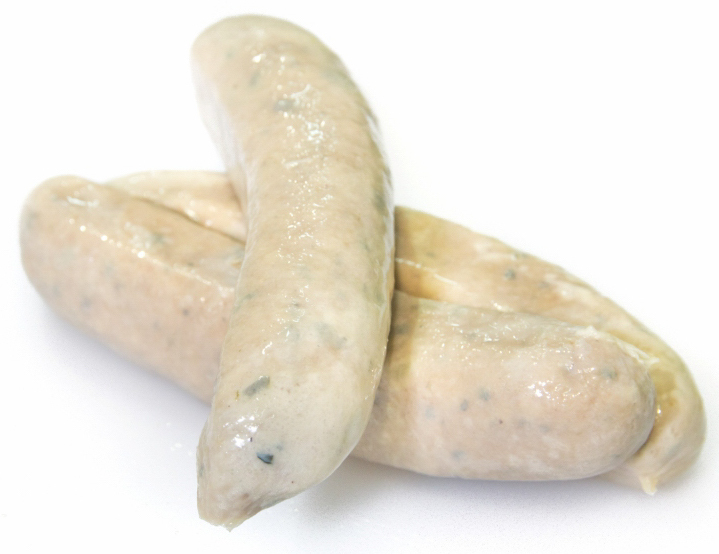 Usually boiled in water, we sell wholesale weisswurst during the Oktoberfest season. Made with pork, beef, chicken or turkey, these outstanding sausages have become one of the most popular varieties of German sausages around. This sausage has been spiced with paprika, salt and pepper although some butchers do smoke it as well. It tastes fantastic with mustard, as most German sausages! With a distinctive garlicky flavour, this tasty sausage has been seasoned with paprika, mustard seeds and black peppercorns and is just perfect for sandwiches. No, there's no beer in it! But we do think it would go well with it. Try One or Two Types of German Sausages with Your Customers! If you're a deli that makes daily sandwiches for your customers why not try something like the bierwurst? We sell paprika sausages﻿ wholesale; their pungent flavour and great colour makes it also an ideal sausage for a discerning delicatessen shop. For restaurants, pubs, hotels and other places where catering is involved, we recommend that you try some of the sausages above mentioned. Our hot dogs and German sausages are premium quality; their excellent ingredients make them top of the range. If you're interested in buying frankfurters/hot dogs, German sausages or any other premium German products at unbeatable wholesale prices please get in touch. You can also download our products brochure below. Get in touch if you'd like more information regarding any of the products mentioned in the article as well as other German premium products. Previous Post Hot Dog Bain Marie UK: Best Hot Dog Equipment in UK with Us! Next Post Hot Dogs for Sale in Bulk Wholesale and Other Premium Products: Watch Out for Our Monthly Promos!